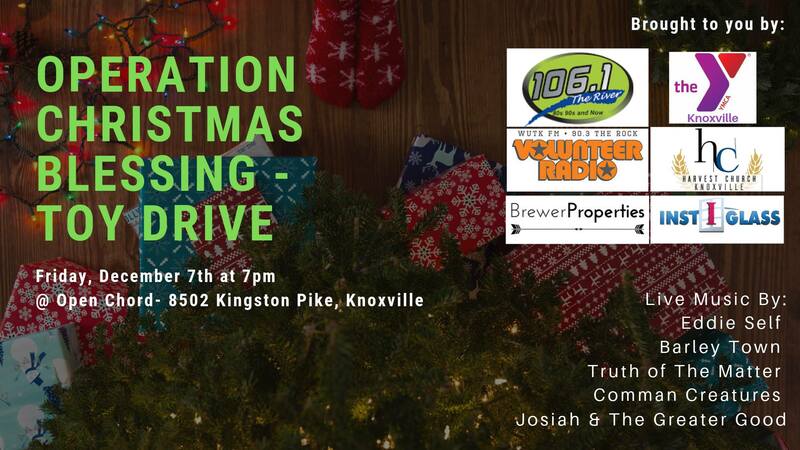 WUTK is a proud sponsor of Operation Christmas Blessing! Open Chord is hosting a toy drive to benefit children in need this holiday season. Open Chord is looking for donations of toys for ages 3-13 ( $5-$20 in value). Any toy donation will gain admittance to the event and 1-5 raffle ticket entries per toy, based on value. More toys equals more chances to win! First prize is a full year membership to the YMCA. Other evening festivities will include an ugly Christmas sweater contest with a cash prize, and live music from Josiah & The Greater Good, Eddie Self, and more! For those that wish to donate a toy but cannot attend the fundraiser, there will be two opportunities to take donations to Harvest Church on Thursday November 15th and Thursday November 29th from 7-9 PM or any Sunday morning from 9:30-10:20 AM an Usher will take your donation.